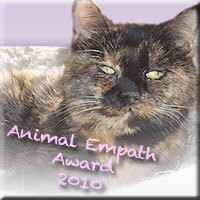 The Conscious Cat and Stacia Kelly at Mind-Body-Spirit Works have created the Animal Empath Award. The award is given to individuals who have dedicated their lives to making the world a better place for animals. It will be awarded once a month by Mind-Body-Spirit Works and The Conscious Cat. If you know one of these special human beings deserving of this award, please send a nomination e-mail to Stacia Kelly or Ingrid King for consideration. Thanks to Stacia for creating the wonderful badge for the award, featuring none other than Buckley! Our first award goes to Cindy Ingram. Cindy Ingram is the founder of Casey’s House, a private rescue group in Bluemont, VA, that specializes in older and hard to adopt cats. Cindy has a special place in my heart because she rescued my precious little Buckley, the subject of Buckley’s Story – Lessons from a Feline Master Teacher, from a farm in southwestern Virginia, where she and about twenty other cats were kept in marginal living conditions. 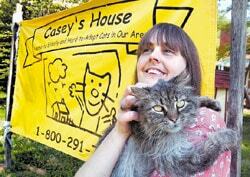 Casey’s House is named after Cindy’s beloved tabby cat, who came to live with her when she was fifteen years old. At first Cindy refused her entrance to her house, as she already had two cats and two dogs at the time. Casey, however, was not a cat to take no for an answer. Casey’s “home” at the time was a colony of some fifty cats, and she was probably getting tired of either not getting to her food on time, or eating off of filthy dishes. Every evening, Casey would be waiting on Cindy’s porch, obviously hungry, so Cindy would feed her. Slowly, but surely, Casey became a part of Cindy’s family. Eventually, four of her feline colony friends came to join Casey. Says Cindy: “Casey taught me to reach beyond my self-imposed limits, and her house is the dream that now has become a reality”. In addition to providing a safe haven for older cats, Casey’s House also promotes Trap-Neuter-Return. Through this program, feral cats are humanely trapped, brought to a veterinarian to be evaluated, spayed or neutered, vaccinated and ear-tipped. Cats that are friendly to humans and kittens are adopted into loving homes. Healthy feral cats are returned to their outdoor homes. Casey’s House spayed and neutered more than 200 cats in 2009, making a significant contribution to controlling the overpopulation problem. Cindy created a wonderful environment for the cats. There are very few cages, most of the cats live in a large open room, filled with carpeted ramps, cat climbing towers, and lots of soft pillows and blankets for them to sleep on. New rescues and those with potential health conditions are kept in separate areas until they’ve been checked out by a veterinarian. What was really amazing to me was how peaceful the energy in that large room felt. All the cats seemed to get along, there was no hissing, posturing, or fighting. Cindy said in all the years she’s done this work, she’s only had one incident with two cats fighting. Casey’s House truly is a safe haven for cats in need. Like all non-profit organizations, especially those helping animals, Casey’s House is struggling in these tough economic times. If you have a favorite shelter or rescue group that you support, please consider making a donation to them – they need your help now more than ever. And if you don’t already support a shelter, perhaps you’ll consider making a donation to Casey’s House in Buckley’s memory. Cindy and the cats at Casey’s House will thank you. It’s been an interesting couple of weeks here! 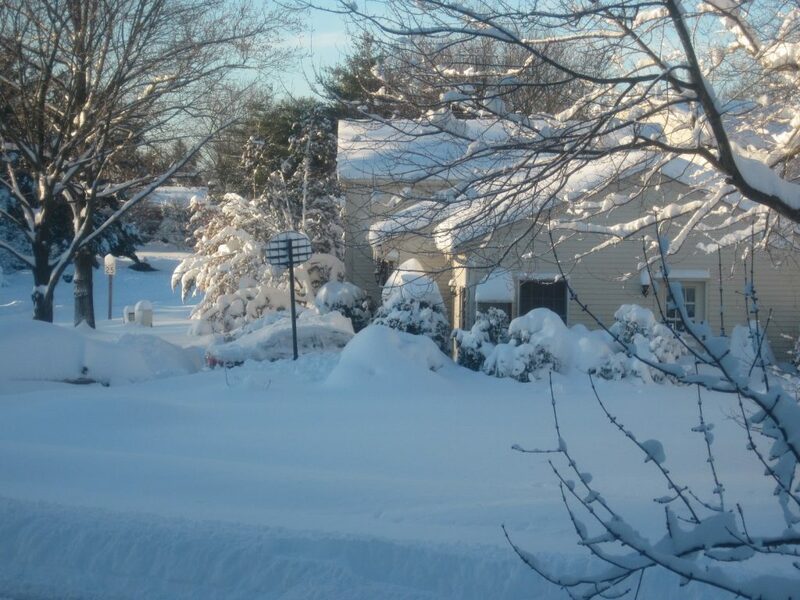 We got a lot of snow, and I mean a lot! The photo above shows you what we woke up to Saturday morning – and that was less than half of what we got altogether that day. Mom was really stressed about things on Saturday. She woke up at 3am and realized that our power had gone out. I don’t know what she was so worried about, we were snuggled in bed together and it was nice and toasty, but I could feel her energy going all weird on me and I knew she was scared. After a while, I realized what she was worried about – it got a little colder than I like to it be in our house. I guess this power she was so worried about is what makes our house warm. I wasn’t worried, though – I knew Mom wouldn’t let me get cold. She put out lots of blankets for me to snuggle in. I just wished she’d stayed inside to snuggle with me, but instead, she kept going outside to do what she called shoveling. It looked to me like she was just moving the white stuff around, and I don’t understand why she didn’t just leave it in place, but that’s humans for you. Whenever Mom came back inside, we snuggled under the blankets together, so I thought it was a pretty decent way to spend a Saturday. Thankfully, this mysterious power came back on Saturday afternoon and Mom started to relax, not to mention warm up! Sunday was a gorgeous day, the picture on the left shows you the view out of our living room window on Sunday morning. Mom says it’s called winter wonderland. All I can say is it was blinding to look outside and see all this white stuff, with the sun reflecting off of it. But I was happy to have my sunny spots back and spent the day soaking up warmth and snuggling with Mom. 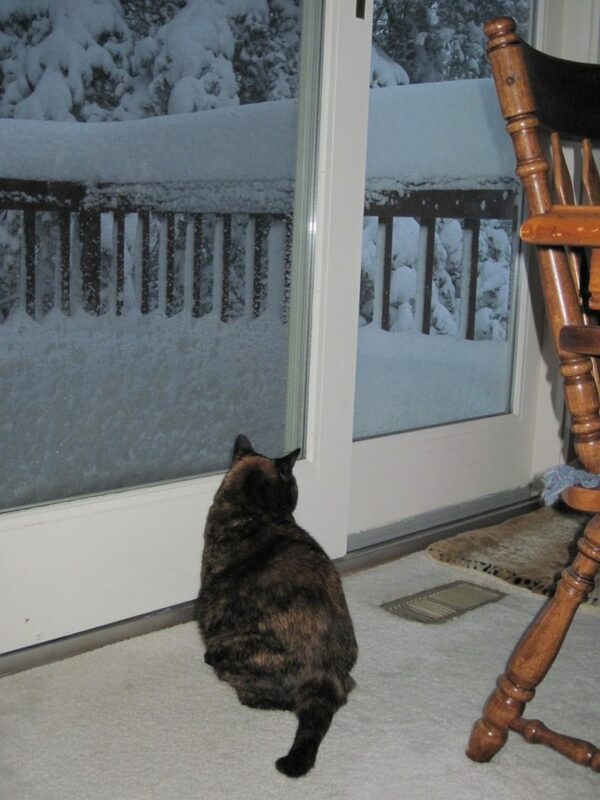 On Tuesday, Mom started getting worried again – apparently, they were calling for more of that white stuff. I think Mom was scared that we’d lose the power again. I hate when Mom worries, and I knew I needed to find a way to help her. I was getting a little frustrated with Mom, it was like she was forgetting all the lessons my sister Buckley had taught her about not getting caught up in fear and worry. So I made sure to remind Mom that Buckley wouldn’t like it that she’s already forgotten the lessons, and I think it really helped Mom. She even blogged about it (Letting Go of Fear and Worry During the Storm). So when round two of this snow stuff started, Mom was calm, which made things much more pleasant. It helped that the power stayed on. I got a little scared when the wind kicked up big time (Mom said it’s called a blizzard when it does that), but Mom reassured me that everything was going to be fine. I like how we help each other. 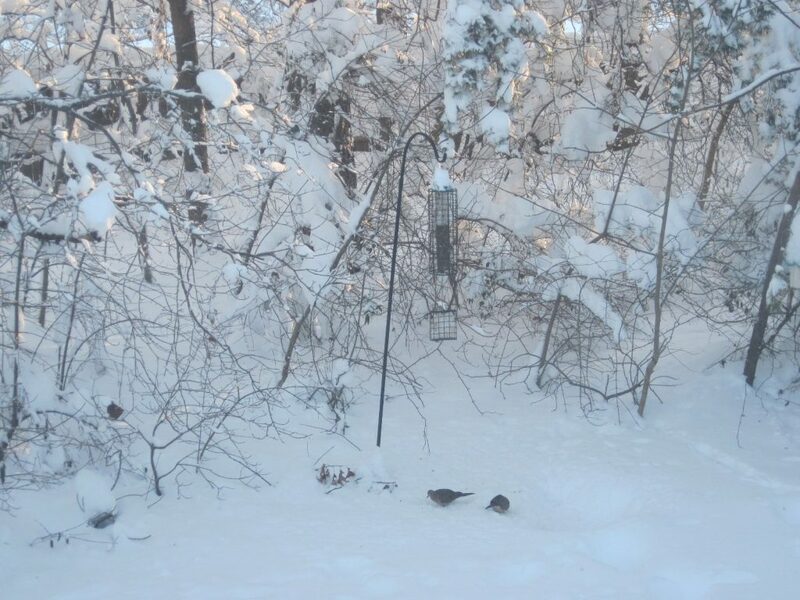 The storm made for some great bird watching. I have to respect these little birdies, they’re made of tougher stuff than I am. I’d hate to have to be out in this kind of weather. I’m so grateful I’m an indoor kitty. Things are back to normal as far as I’m concerned. And anything that keeps Mom home with me even more than usual is fine by me. I do wish they made kitty sunglasses though – it’s just so bright out there! I think I’ll just take a nap in the sun. It’s hard to know where to begin to introduce Bernadette Kazmarski. 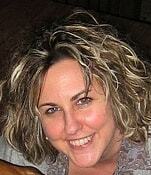 She is a multi-faceted creative spirit: artist, writer, graphic designer, painter, animal advocate, environmentalist. I met Bernadette at the Cat Writers Association conference last November, and I’ve been fascinated by her creations ever since. From commissioned pet portraits to animal inspired merchandise ranging from prints to textiles to greeting cards, looking around Bernadette’s websites are a feast for the senses. It’s my pleasure to introduce this wonderful artist to you today. Welcome to The Conscious Cat, Bernadette! Hello, Ingrid, and thank you for inviting me! And also thank you for visiting my website and giving me a “positive review”. You told me that you have your cats to thank for being an artist. How did they inspire you? At a time in my life when my artwork was ready to emerge, they were there as my muse. I studied English in college and intended to be a writer and a college professor, and someday take the time to follow my interest in art, but I never thought I had much talent. My career plans changed and I found myself with some time after work as a typesetter at the end of the day, and was moved to try drawing again on my own. I was visualizing sketches of my cats, and I’m convinced that those first sketches were successful because of how I loved my cats. If that family of cats hadn’t been there, I don’t know that I would have continued, or even made a serious start at drawing and painting. I was first introduced to your work through the sample greeting card you enclosed with the materials at the Cat Writers Conference . My package had Cookie Looks at Me in it, and I thought it was one of the most beautiful cards I’d ever seen. Tell us a little bit about how you came to create the cards. How wonderful that you, with your special love of tortie cats, got the card featuring my special tortie out of the dozen different samples I had brought with me! They came from the experience of many losses. I had always had the idea in mind for general animal sympathy cards, but knew I was waiting for a “cat”alyst, inspiration from my cats, and I was also waiting for my design ideas to mature so that I had a diversity of ideas to offer to others instead of my more personal sentiments. I had lost cats in the past, but endured the loss of most of my household in a short period of time. 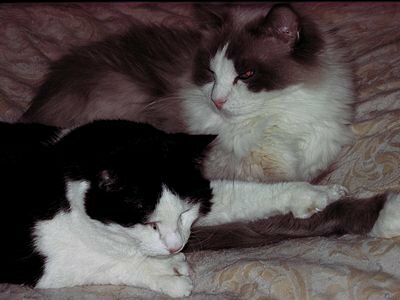 Between February 2006 to January 2007, I lost my four oldest cats, one to cancer, one to kidney failure, the other two just to old age. Those two, Stanley and Moses, were the last two of the ones who had been with me from those earliest days and seen me begin my career as an artist. They were also my first teachers as I worked to learn about feline health. Moses, the first loss of the four, was 19 and had been feral but was the most gentle creature I’ve ever known, and Stanley, the last loss of the four, was with me for 21 years and came to me as an adult, so he had to be 23 or older, and part of their gift in this was to give me a perspective on my feelings about living with animals through those long, complex relationships. Then just a few months after Stanley, Lucy, the rescue kitten I’d decided to keep, was diagnosed with effusive FIP at the age of one year, and I lost her three months later, learning the lesson of loss in a relationship in the full bloom of first love. My Namir was diagnosed with hypertrophic cardiomyopathy and congestive heart failure just before all this began, and I lost him in July 2009 after all the others and after four years of caregiving. I had known that his time was limited, and his loss was kind of an ending point for that cycle. Each time I’d lost a cat, I designed a card dedicated to them and sent it out to friends as a part of my grieving process—I’m an artist, and creating is how I work through everything from joy to sorrow. I also received a number of sympathy cards from friends and saw that not much was available for the loss of an animal companion. Even in their passing they are teachers, and with Namir’s loss I knew the time was right. I pulled together all the photos and some of the art I’d been visualizing, wrote the text from my heart remembering the most comforting things I had heard and thought and said to others in their losses, and put all the cards together. I could hardly work fast enough to keep up with my thoughts. What is the creative process like for you? Do you paint from live models, memory, or photographs? I actually work in all three ways to get there, usually a combination of the three in one work I always start from my initial “inspiration” which comes from life, something I’ve seen or experienced, even if the work is not realistic, then if it’s not possible to be able to do the work in that moment, which it usually is not, then I have memory and photographs as reference. In the end I put everything aside and simply intuit the last details that come from my deep, creative self and then I know the painting is finished. All this is true not just for paintings but also writing and photography as well. Visualization of that finished work is not a conscious act nor is it something I can force, it’s just something that’s always been a part of my consciousness from the time I can remember. I learned in painting my cats how important this visualization was and that it needs to exist before I can start. I need to see my goal before I start or I don’t know what to do. Not that I can always see it in all its detail, or that I always end up with that initial visualization or force myself to stay with it. I can usually see the medium I’ll use, and this even happened before I knew how to use a medium, like watercolor. All of my images of my own cats were created this way, not just the paintings and sketches but even the block prints and photographs—I saw that beautiful moment that I wanted to share and in that moment saw the finished work. Then I set about enjoying my path to that end. I then applied this to all the other work I do and I’ve found it’s how I instill a part of myself in each one. Tell us a little about your feline family members. Oh, my, I don’t know where to begin! I live with nine wonderful cats right now, and I’ve always lived with seven to nine in my household. I’ve rescued and fostered for almost 30 years, and my household has evolved; everyone was a member unless they were adopted out. While I actively took in cats, I’ve never really consciously adopted a cat. I let the universe decide who was to stay and share my life more permanently. You can read many stories from the past by visiting “My Cats” on my website. Thank you for stopping by The Conscious Cat, Bernadette! 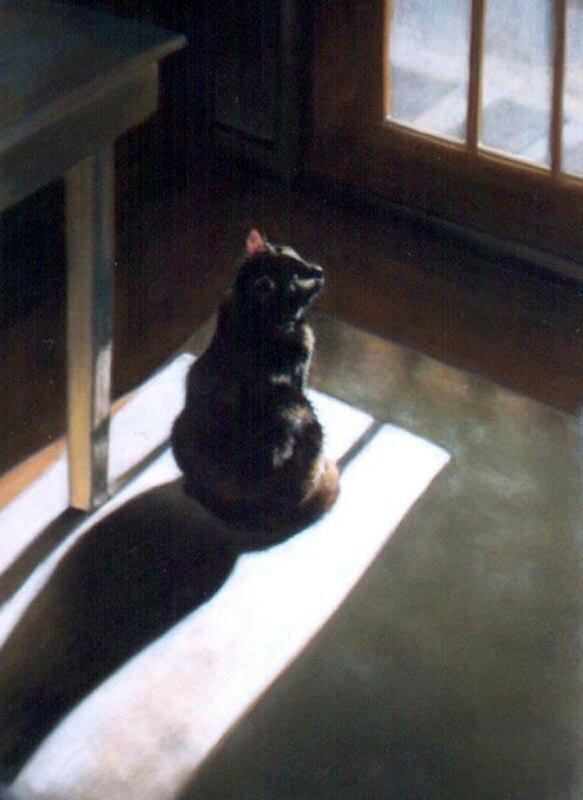 Be sure to visit Bernadette’s websites at http://www.bernadette-k.com/ and http://portraitsofanimals.wordpress.com/ and look around – it’s like visiting an art gallery. I previously wrote about how to choose healthy foods for your pet. In the article, I said that I was not a proponent of a raw food diet, because I felt that the risks outweighed the benefits. However, I have since come to the conclusion that feeding raw food is truly the healthiest way to feed our pets. We know from human nutrition that the less processed our foods are, the better for us, and the same holds true for our pets. Additionally, cats are carnivores, and as such, they are designed to eat raw meat. That being said, some pets, especially cats, can be difficult to transition to raw food . 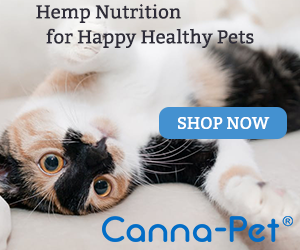 For those pets, the the next best thing for achieving the same results you get from raw feeding may be supplementing your pet’s diet with digestive enzymes. The reason raw food is so good for our pets is because it still contains all the digestive enzymes. When food is processed and cooked, enzymes are destroyed. Enzymes aid in food absorption by breaking food down into simple, soluble substances that the body can absorb. Enzymes are important building blocks for a multitude of metabolic functions and can help the body fight the degnerative processes that come with aging, aid in better absoprtion of vitamins and minerals, and help build a healthy immune system. Enzyme deficiency can show itself in poor haircoat, allergies, intestinal problems, and voluminous stools, often with the fat still clearly visible. If you’re not able to feed raw, you may want to consider supplementing your pet’s diet with digestive enzymes. There are numerous products on the market. One I like is Dr. Goodpet’s Feline Digestive Enzymes. In addition to enzymes, it also contains probiotics. It also has absolutely no scent or flavor, which can be an issue with cats. Amber readily accepted it on the very first try and has been taking it for the last few weeks. The most noticeable difference so far has been a marked decrease in the size and the smell of her stools. The research, and testimonials, for the benefits of digestive enzymes, are convincing. Like pets on raw diets, enzyme supplementation can help your pets look and feel great. Pets on a raw diet tend to have glossy coats, clear ears and eyes, and better teeth. They maintain their ideal weight. They don’t have allergies or intestinal problems. If you’re not able to feed raw, enzyme supplementation can help you achieve the same results. As a side note, I wanted to test the benefits of digestive enzymes for myself, so I began taking them right along with Amber (not the feline version, though! I choose a product designed for humans, Enzymedica Digest). While I can’t say that my coat has gotten glossier, I’ve definitely noticed an improvement with my digestion! I’ve also noticed that I don’t get hungry as quickly as I used to in between meals. My – completely unscientific – assumption is that it may be due to the fact that my body is absorbing nutrients better as a result of the added enzymes. Please note: if your cat is diabetic or immuno-suppressed, digestive enzymes may be contra-indicated. 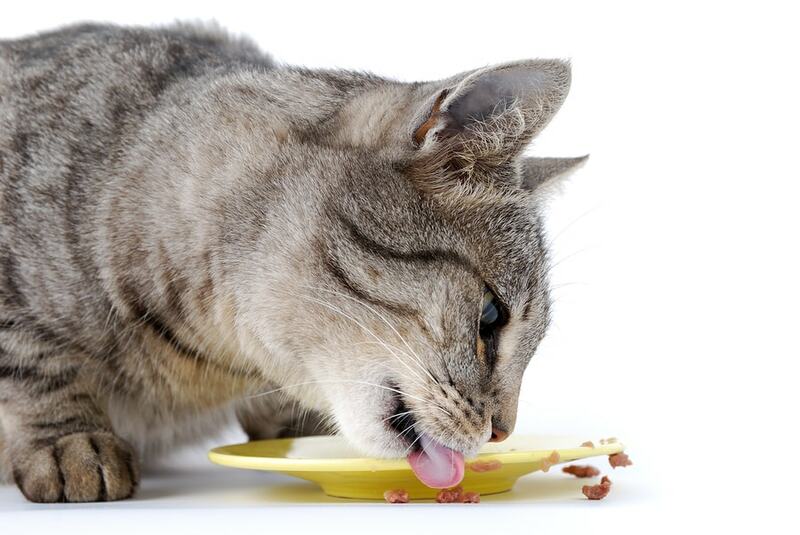 Check with your veterinarian before changing your cat’s diet or adding supplements. The Conscious Cat is delighted to have received the “Over the Top” Award from Mason Canyon and her lovely blog Thoughts in Progress – thank you, Mason! The award comes with several conditions: Answer the following questions with one-word answers, pass the award on to five other bloggers and leave a comment on their blogs about the award. While not technically a book about animals, Why My Third Husband Will Be a Dog– The Amazing Adventures of an Ordinary Woman by crime fiction author Lisa Scottoline deserves to be reviewed here because Scottoline’s love for her assorted menagerie of dogs, cats, and chickens comes through in almost every single one of this collection of her wildly popular columns from The Philadelphia Inquirer. Scottoline writes about life, love, family, pets, and murderous toasters, among many other things. As a woman of a cetain age, you will find yourself nodding your head in recognition, laughing out loud, and applauding the author for both her irreverance and her sense of humor as well as her deeply felt and beautifully expressed love for her family, both human and furry. I love Scottoline’s novels and I’ve always wondered about how much of herself was in her heroines’ characters. This book answers that question, and it made me like a favorite author even more. In some of the animal related chapters, she writes about her two kittens; one of whom adores her, and the other, in the author’s words, “wishes me dead.” She writes about Ruby, the corgi on Prozac. She writes about Lucy, her golden dog in more than just breed. I thoroughly enjoyed this book. These brief, funny, sometimes biting, but always warm-hearted slices of life will resonate with most women, and they will also delight animal lovers. For more information about Lisa Scottoline, please visit her website. I’m giving away one copy of this book to one lucky reader – please leave a comment and tell me why you’d like to win this book. Giveaway ends Friday, February 19. Last night, I finished reading Buckley’s Story, Lessons from a Feline Master Teacher by Ingrid King. Although I had purchased this book last fall, it was too difficult for me to read, having said goodbye in November to our beloved boy cat Matisse, aka Mr. Boober, after his brave battle with lymphoma. 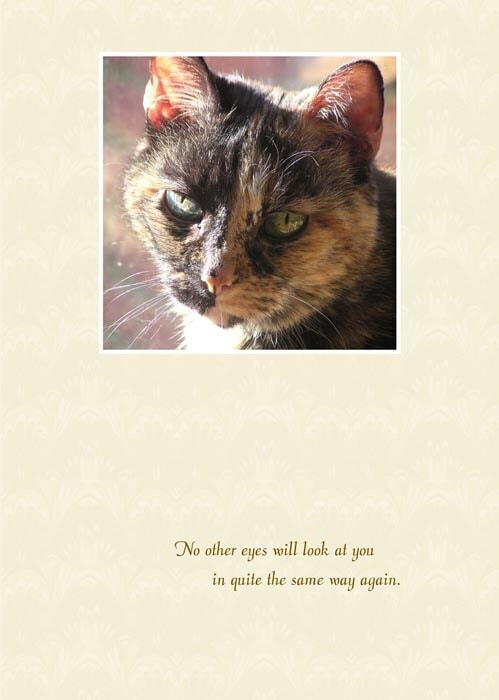 Ingrid’s book is more than just a story about a special cat named Buckley, for Ingrid touches upon many aspects of the human-animal bond, as well as the animal-animal bond, including intuition and communication, that really make one stop and think. This is a book that sticks with you after you finish it, and no doubt I will be reading sections over again. This concept – holding the space – is what our cat Mr. Boober did in our home, especially with our two girl kitties Lulu (his little sister) and Aliza (for better or for worse, his constant companion.) But we didn’t realize this until he had passed away. The attitudes of the girls, and the dynamics between them, were suddenly all messed up. The girls didn’t know quite how to cope, because the one who had held the space for them was Boober, and now he was gone. My husband and I described Boober as the glue that kept the three cats together and content. Holding the space. I am fortunate to have met Ingrid via Twitter (gotta love social media!) and we’ve become friends. Ingrid thinks that perhaps Aliza or Lulu might eventually step up to fill the void (and hold the space) but of course it won’t be exactly the same. It immediately made me think of a series of pictures that I took last fall. Both girls were extremely attentive to Boober toward the end of his life when he went blind. Aliza and Lulu would stick close by him…taking turns cleaning him…just being with him. Aliza especially, who was literally hopelessly in love with Boober, rarely left his side. I wanted to take some pictures of the two of them together, although our digital camera wasn’t cooperating. When I came around the bed, I saw Aliza’s paw and arm on top of Boober’s. My heart melted, and I’m so glad I captured this moment. I think Aliza’s only concern was to provide comfort and serenity in the midst of some scary changes. I think during those moments, she was holding the space. Laura Kuhlmann is the owner and designer of Petscribbles, a unique line of hand-crafted greeting cards for, from, and about pets. Laura designs and makes the artistic and upscale, yet fun, personal, and whimsical cards herself. The cards are made to order in Little Egg Harbor, New Jersey, USA, and only the best cardstocks, decorative papers and embellishments are used. Laura and her Chief Feline Officer Lulu pride themselves on using recycled materials whenever possible. Laura and her husband are owned by two cats: a 9-year old Ragdoll girl named Lulu (the CFO mentioned above); and a 15-ish years young formerly feral kitty named Aliza-Loo Doolittle. Aliza enjoys a fulfilling retirement doing very little work (aka Doolittle). We’ re reaching that time of year where, even though the days are getting longer, winter just doesn’t seem to want to end, and the longer days of spring and summer seem ages away. While this is felt by most people to some degree, some people experience a serious mood change when the seasons change. They may sleep too much, have little energy, and crave sweets and starchy foods. They may also feel depressed. This is known as the winter blues, or seasonal affective disorder (SAD). While severe cases may require treatment by a physician, here are some tips that can help until spring arrives. In addition to the obvious things like eating right, exercising and getting enough sleep, make sure you schedule activities that get you outside, no matter what the weather. Even a few minutes of natural light a day can make a difference in how you feel. Put more light into your life. Having a lot of lights on in your house may not be a substitute for natural sunlight, but it can raise your spirits. When it’s dark outside, a dark, gloomy house just contributes to a low mood. Replace ordinary light bulbs with full-spectrum bulbs. For severe cases, consider getting a lightbox. Reframe your thoughts about winter. Even if it’s not your favorite time of the year, find something to appreciate about the season. If it wasn’t for fall and winter, we wouldn’t enjoy spring as much. Reiki has been proven to help with depression by putting the body, mind and spirit into a deep state of relaxation. Even one treatment can provide immediate relief. When all else fails, curl up with a good book, a cup of hot chocolate and your favorite pet, and enjoy the cold, dark days from a warm spot on your sofa! The Conscious Cat is tickled to have received the Blogger Purrfection Award from Crystal at Crystal Clear Proofing – thank you, Crystal! If you’re a writer and you’re not already following Crystal’s blog, you should (and she also has some adorable cat photos in her sidebar!). About Vet Med – animal news, facts and fun stuff. This is the personal blog of Janet Tobiassen Crosby, DVM, the Guide to Veterinary Medicine at About.com. The Creative Cat – art, portraits, photos, writing. 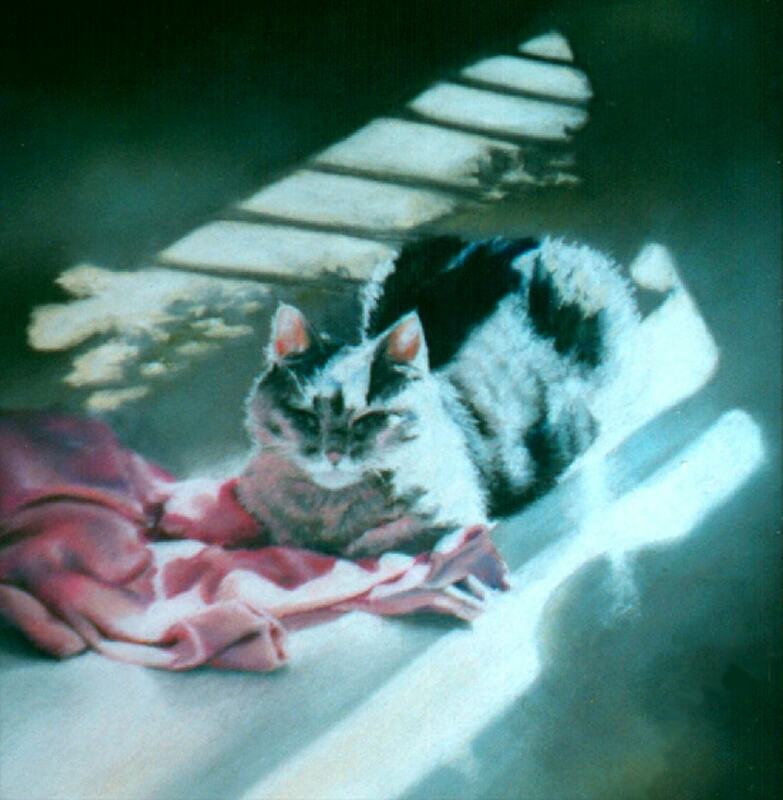 This is the blog of animal artist Bernadette Kazmarski. 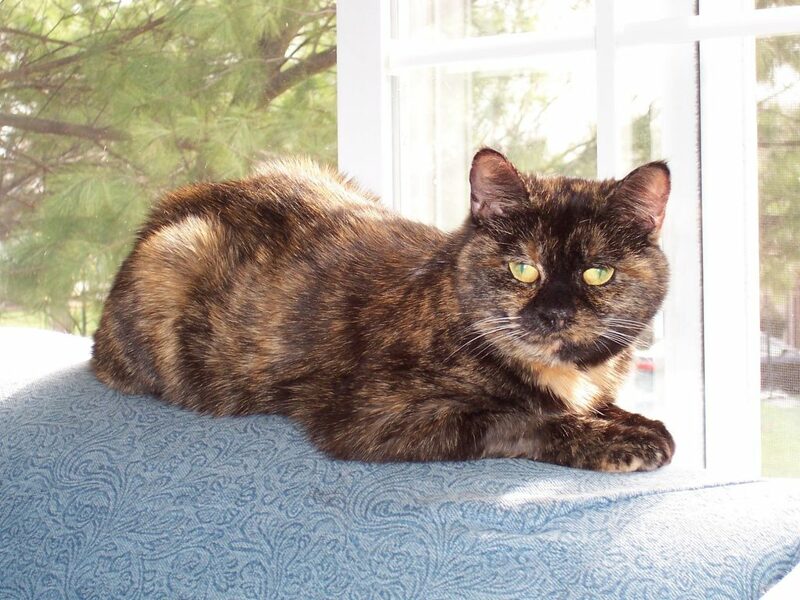 Look for a profile of Bernadette here on the Conscious Cat soon. Madame Purl – Adventures of an Aspiring Fiber Artist. This blog belongs to Rose Hoffa, knitter, spinner, and cat lover. The Boomer Muse – the daily photo diary of a hyper-hyphenated, tree-hugging, Canadian Baby Boomer/Photographer/Writer/Intuitive Consultant/Cat Lover. I really can’t say enough wonderful things about this blog – a feast for the senses. The Daily Tail – Daniela Caride’s blog, a wonderful collection of cat stories, dog stories, pet related news, and more. 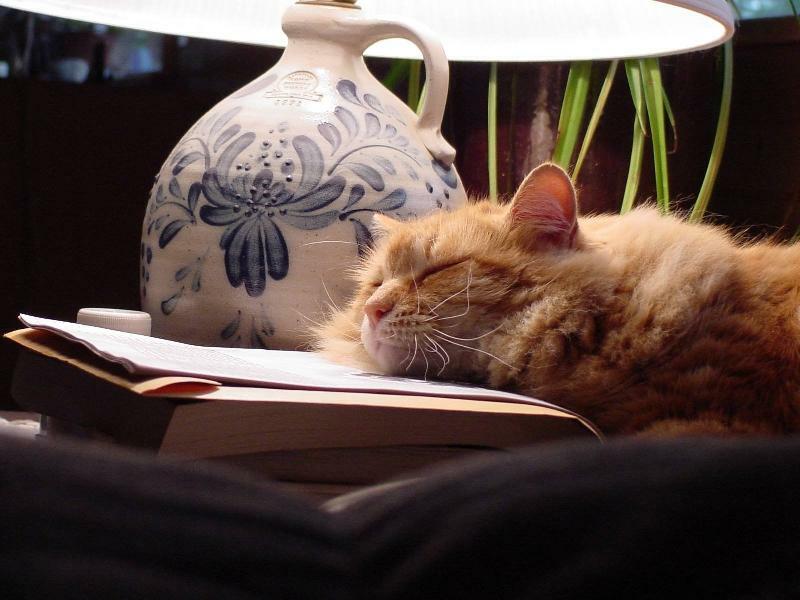 Musings of a Bookish Kitty – a great book review blog by Wendy Runyon. 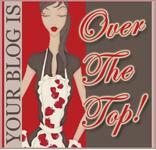 Please pass this award on to other deserving blogs! There are many stories of animals as healers. Research shows that simply petting a cat or dog can lower your blood pressure. Therapy animals who visit nursing homes and hospices bring peace and joy to patients who may not have smiled in months. There are stories of horses who help people heal emotional and psychological issues, stories about dogs who can somehow sense cancer in people, even before doctors can find it, and dogs who can tell when a person is about to have a seizure. At one time or another, all pet owners have experienced the comfort of having our pets close by when we are sick even with something minor like a cold or the flu. Research has even shown that the frequency of a cat’s purr can aid with healing of bones, tendons, ligaments, and muscles as well as provide pain relief. I’ve met a number of these healer kitties during my years of working at veterinary clinics. They would work their magic in various ways – by curling up next to a recovering cat or dog, by cuddling up to a worried client in the waiting room, or by comforting a staff member who had just assisted with a difficult case or a euthanasia. But none of these cats was more of a healer than Buckley, the subject of my book Buckley’s Story – Lessons from a Feline Master Teacher. Buckley would do all of the things mentioned above while she lived at the animal hospital. After she came home with me, she became my assistant Reiki practitioner. Reiki is an energy therapy that originated in Japan. As a Reiki Master Practitioner, I transfer energy to my client by placing my hands either directly on or slightly off the body. I work with pets and with people, and I’ve found that animals, especially cats, are incredibly receptive to the Reiki energy. Some even say cats invented Reiki. While that may be a little far fetched, cats seem to intuitively how to utilize the energy for their greatest good. Buckley loved being in the Reiki room while I was giving treatments, and as long as the person receiving a treatment liked cats and did not mind Buckley’s presence, she was allowed to stay. But just being in the room was usually not enough for her—she became an active participant in the healing session. She would get up on the Reiki table and often curl up next to or on top of the client. I realized after a few sessions like this that she intuitively knew where extra energy was needed, and the client would often report an added feeling of heat or pulsing in the areas where Buckley had been situated during the session. I often skipped the areas Buckley laid on during a session and concentrated on others instead. I knew my little healer kitty had it covered. I think she also transmuted the energy in the house in general. All cats do this to some degree. Cats are sensitive to energies and have the ability to change negative energies into something peaceful and calming. Buckley seemed to be a master at this. More people commented on the peaceful energy in my house after she came to live with us than ever before. Animals bring a spiritual component to healing as well. Buckley’s intuitive knowing during a Reiki session about where the energy was needed came from a spiritual dimension. It takes many human Reiki practitioners years of practice to achieve that level of intuitiveness. How have the animals in your life helped you heal? I’d love to hear your stories.